Studio 657 is a regular posting-place for the observations of London design consultancy Consultants in Design. 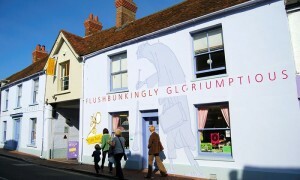 CiD are delighted to have won a competitive pitch to revitalize the Roald Dahl Museum Café Twit brand, to highlight their unique selling points, improve turnover and increase footfall to the café. CiD have carried out a visual audit and have proposed an imaginative typographic solution to enliven and improve the overall aesthetic, the menus and the customer experience and bringing the café closer to the Roald Dahl Museum branding.